Large, broadly dome-shaped evergreen shrub. Glossy mid-green leaves. 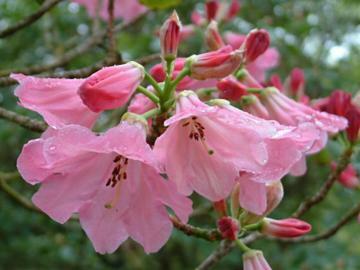 Loose, open trusses of trumpet-shaped, deep rose pink flowers in April and May. Hybrid of Rh. fortunei x Rh. thomsonii bred by Luscombe of Coombe Royal near Kingsbridge, Devon, UK, in 1880.